If you are looking for a technique to make planning your work easy and affectice; whether it be the first draft stage of a speech or any written work , become a child again and create a colourful Mind Map. Mind mapping originated in the 1960s with Tony Buzan and allows you to generate an organic explosion of ideas. Just like a road map a Mind Map will give you an overview of your topic, enables you to tap into the wealth of your imagination, collect together large chunks of data and be enjoyable to review and consider how to progress. 1. Take a sheet of blank unlined paper. Use it landscape rather than portrait style. 2. You will need a container of coloured pens and pencils. 3. In the centre of the page draw an image or write the topic that you want to explore from there create logical and illogical branches of thoughts to spin off from the central title. The one above is an old one of mine. I create Mind Maps not only for work but for everyday issues where I need to see things more clearly. 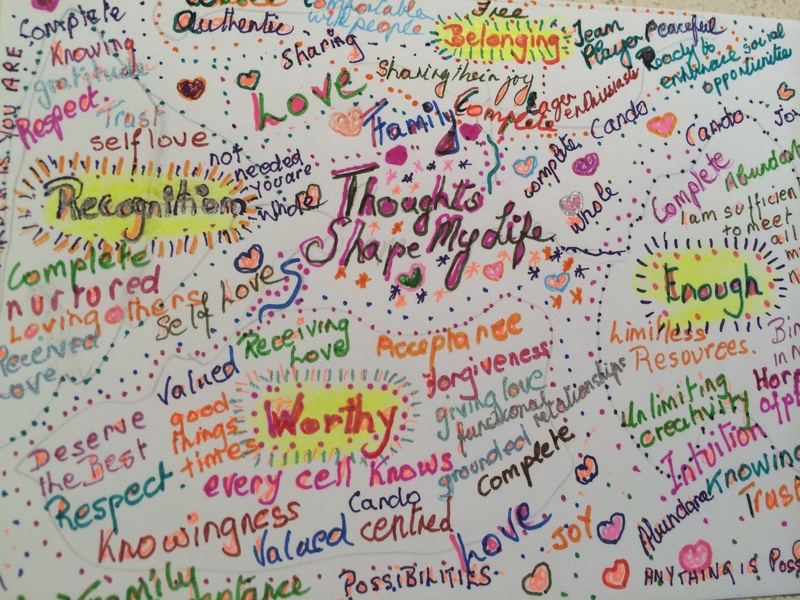 This Thoughts Shape Your Life Map is very busy, the ideas just kept coming and I was running out of room but the finished Map gave me great clarity on how my everyday, every moment thoughts affected my life for the better or worse.